This article explains the importance of information technology applications used for civil Engineering structural constructions. Traditional engineering drawings describe structural elements of construction. Today, we use more advanced technologies that help make drawing technical designs easier. Early engineering drawings served two purposes; they were used as a reference for engineers, and they were used to build or construct what was portrayed. Earlier drawings were more symbolic than what we are familiar with today; the engineers understood the intent of symbolic diagrams and were not taken account actual dimensions because every aspect of construction or structural element that engineers worked on was their own development. Computer-based graphic systems began to be used to improve the productivity of engineers, and large engineering companies slowly began recognizing designers. The design procedures and standard codes are critical in designing the structural engineering elements for engineers taking the SE exam. Graphical manipulation services are the functions that can handle user interactions in a graphical system and display requested design on the output screen. In the 1970s, new graphical manipulation software was developed to aid in the creation of engineering drawings. This software is known as Computer Aided Design (CAD). In the mid-1970s, as computer-aided design systems provided more capability than to reproduce manual designing with electronic designing, the cost benefit for the organization to switch to CAD became apparent. The earliest CAD systems handled two-dimensional data, emulating traditional drafting practices. Then CAD changed its technology from two-dimensional to three dimensional, which was completed using wireframe geometry. At present, a large number of software applications are available in all of the sub disciplines of the construction process. 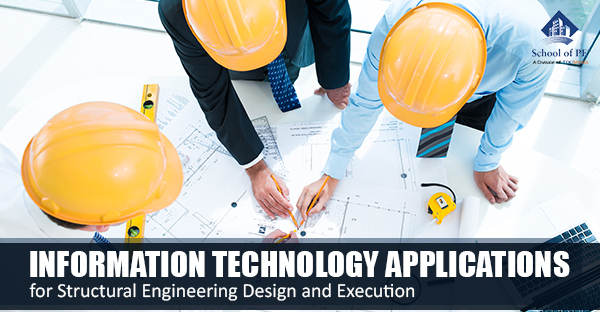 These software applications help structural engineers to construct buildings, dams and highways in an easy manner. Information technology is the backbone of the construction industry. Software is used to increase the productivity of the designer and to create a better design quality. Technology helps to improve the communication process with the help of documentation and helps to create a database for manufacturing various structural elements. Nowadays, structural engineering calculations have become easier on the Structural Engineering exam due to programed engineering calculators. Technology plays an important role in a structural engineer’s working life. At present, the construction industry has high expectations. Clients need their building infrastructures to look appealing, and they should be safe and provide a comfortable environment. Construction software can aid engineers in completing many of these tasks within a short time frame. Construction software has some tools that ensures the project stays on budget by tracking the costs and expenses. Engineering economics and quantity takeoffs in the SE exam review course recaps engineering analysis in construction project management. Construction software can greatly improve the overall quality of construction. It can facilitate more accurate designs and models through apps that allow design changes to be made directly on the systems.